We're back to our regularly scheduled program! 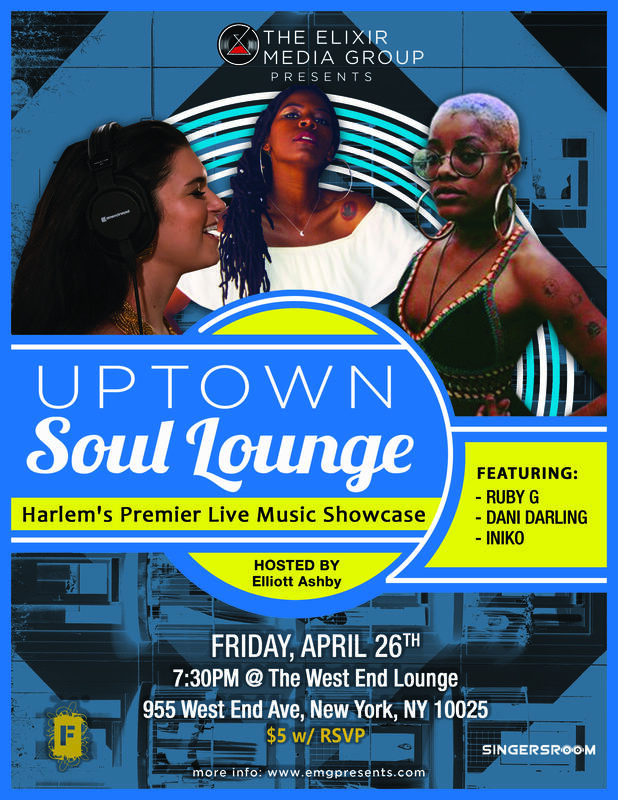 It's been a long time coming, but April 26th will mark the official return of Harlem's most exciting live music series to its monthly Friday schedule at its new home, The West End Lounge. This month, enjoy special, intimate live performances by Michigan's newest lo-fi soul sensation Dani Darling (aka #SoulGalaxyGirl), San Diego's spellbinding soul darling Ruby G, and one of the most celestial new voices on the indie New York soul scene, Iniko. Admission is only $5 with an RSVP, so be sure to hit the link above before the list closes. It fills fast! Admission will be $10 at the door without an RSVP, space permitting. Uptown Soul Lounge is, at once, the revival of Harlem's old jazz/soul ethos, and the birth of a new musical frontier. Started in February of 2016, the series has made its name for bridging the gap between generations, blurring lines in the soul spectrum, and forging Harlem's most vital hotbed for the world's best emerging talent in soul music. Be sure to follow us on Instagram @USLNYC for regular updates. How did you hear about Uptown Soul Lounge?